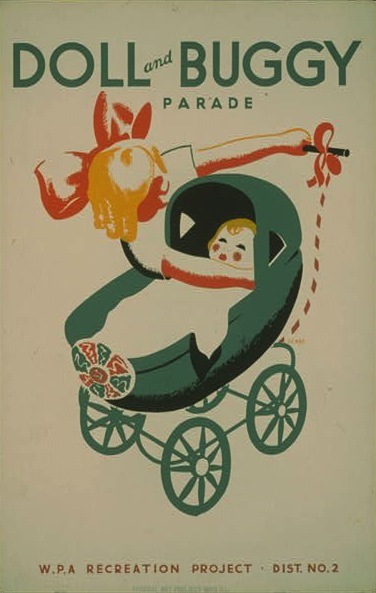 A poster for a doll and buggy parade from the Works Progress Administration's Federal Art Project in 1939. Summertime in Iowa means countless community celebrations and parades throughout the state. Many of today’s Brat Days, Corn Days, and 4th of July festivities had their roots in 19th and 20th century events and continue in the 21st century. 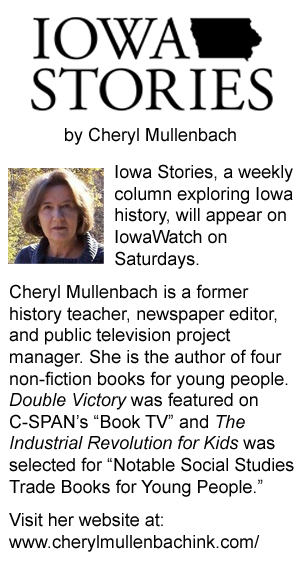 That’s a long tradition of summer fun across the Hawkeye state! A children’s parade held in August 1934 was typical of events across the state at the time. How similar is it to today’s summertime festivals? “Thursday to Be Great Day for Children” the newspaper headline proclaimed. Children in Centerville were in for a good time in their community, and there was serious money at stake too! In the midst of what became known as the Great Depression those monetary awards could be much appreciated in cash strapped rural families. With wheat dropping from $3 per bushel in 1918 to 30 cents per bushel in 1934, corn prices plummeting from $1.23 per bushel to 15 cents per bushel, and farmers claiming that a whole wagon full of oats wouldn’t buy a pair of shoes—Iowa’s farmers and their families looked forward to free entertainment such as the local parades. They offered a few hours of leisure time away from the stress and strain of rural life during the Depression. In Centerville any children under the age of 15 were invited to participate in the parade — their chance to “outshine big folks for a day.” They were encouraged to show what they could do in the way of decorating a bike or doll buggy — in the “most novel or unusual manner possible.” And the family dog or pony could enter the parade too. Judges awarded prizes based on the attractiveness and originality of all entries. Entrants were instructed to meet at the school building at 9 a.m. where organizers would classify the various entries and arrange the line-up. The parade was scheduled to start at 10 a.m. sharp. While the awards may seem trivial by today’s standards, it’s important to keep in mind that 1934’s dollar was the equivalent of a little less than $18 today! In 1934 that would buy four pairs of shoes with a little left over! In 1936 when the children’s storybook Farm on the Hill was published, most Iowans knew Grant Wood as a famous Midwestern artist who was born on a farm near Anamosa in 1891, grew up in Cedar Rapids, and gained instant fame after painting “American Gothic” in 1930, a portrait of a stern looking couple standing in front of their Gothic style wood farm house in Eldon, Iowa. People may not be as familiar with his work from this book.